Sophie Scholl: The Final Days with Julia Jentsch and Fabian Hinrichs. Directed with clenched fists by Berlin Film Festival winner Marc Rothemund, who seems to have been at least partly inspired by Robert Bresson's minimalist The Trial of Joan of Arc, Sophie Scholl: The Final Days is an intense, unsentimental, impeccably produced retelling of the last days of the young female leader of the White Rose, the German resistance movement. 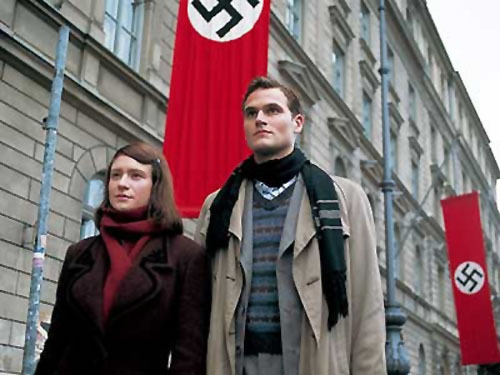 Set in 1943, Fred Breinersdorfer's screenplay chronicles the events that followed the arrest of Sophie Scholl (Julia Jentsch) and her brother Hans (Fabian Hinrichs) after they're accused of distributing “subversive” leaflets at a German university. In the complex title role, Berlin Film Festival, German Academy Award, and European Film Award winner Julia Jentsch is nothing short of magnificent. Jentsch's Sophie is a steely-eyed, relentless defender of freedom and justice, but one who, when not being challenged by the Nazis, can't help but let her guard down. Much to the credit of director, screenwriter, and star, there are no self-glorifying Braveheart heroics in Sophie Scholl; when alone, Jentsch's determined Resistance fighter comes across as any other vulnerable, frightened young woman. But perhaps the most impressive aspect of Jentsch's tour de force was the contrast between the on-screen Sophie Scholl and the pretty, blonde, unassuming (and self-avowedly apolitical) actress who showed up for a Q&A following the film's screening at AFI FEST 2005. Hers was a truly masterful transformation; though one certainly aided by Rothemund's guidance and Sophie Scholl's make-up artists. Sophia Scholl: The Final Days / Sophia Scholl - Die letzten Tage (2005). Dir. : Marc Rothemund. Scr. : Fred Breinersdorfer. Cast: Julia Jentsch, Fabian Hinrichs, Gerald Alexander Held, Johanna Gastdorf, André Hennicke. Note: Michael Verhoeven directed The White Rose (1982), starring Lena Stolze as Sophie Scholl.